Back in 1881, when Evelyn Cheesman was born, English girls were expected to be clean and dressed in frilly dresses. But Evelyn crawled in dirt and collected glow worms in jars. When girls grew up they were expected to marry and look after children. But Evelyn took charge of the London Zoo insect house, filling it with crawling and fluttering specimens and breathing life back into the dusty exhibits. In the early 1920s, women were expected to stay home, but Evelyn embarked on eight solo expeditions to distant islands. She collected over 70,000 insect specimens, discovered new species, had tangles with sticky spider webs, and tumbled from a cliff. Inspire children to believe in their dreams and blaze their own trail with the story of Evelyn's amazing life. Christine Evans is a British author living in California with her husband and daughters. Her work has been featured in Highlights and High Five magazines. 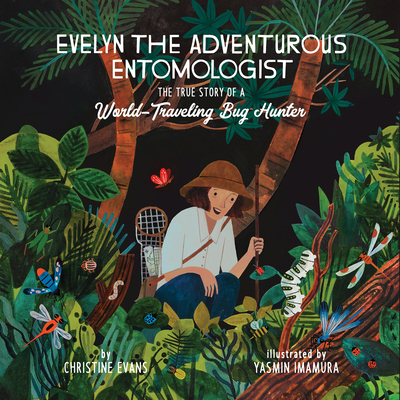 Evelyn the Adventurous Entomologist is Evans' first picture book. Yasmin Imamura has illustrated and designed products for Anthropologie, Papyrus, Sanrio, and more. Her greeting card company, Quill & Fox, includes an in-studio shop of her hand-painted cards that are sold worldwide. Imamura grew up in Manila, Philippines and now lives in Portland, Oregon. Find more of her work at YasImamura.com.